Alright, Bleach is up here. I don’t see the point in putting anymore here. So here you go. The weeks Bleach seems to be really interesting. Another flashback chapter and a lot is revealed about the system of the Gotei 13. Turns out the Maggots Nest was actually a jail for those who were deemed dangerous by Seireitei. Bleach spoilers are out and the latest chapter is another flashback chapter. Seems like it’ll be flashback chapters for a while. The flashback is pretty interesting and is about the time when the Vizards were still in Soul Society. There’s only one spoiler pic and an incomplete script on the first part of the chapter. I’ll update with more spoiler pics and an updated script as they appear. Update: English Bintopia Scans are out. This weeks Bleach looks pretty good. Everything has been set up for the final battle and it looks like it will be one hell of a battle. Karakura Town has somehow been moved to Soul Society so the captains will be able to fight against Aizen and the Espada. 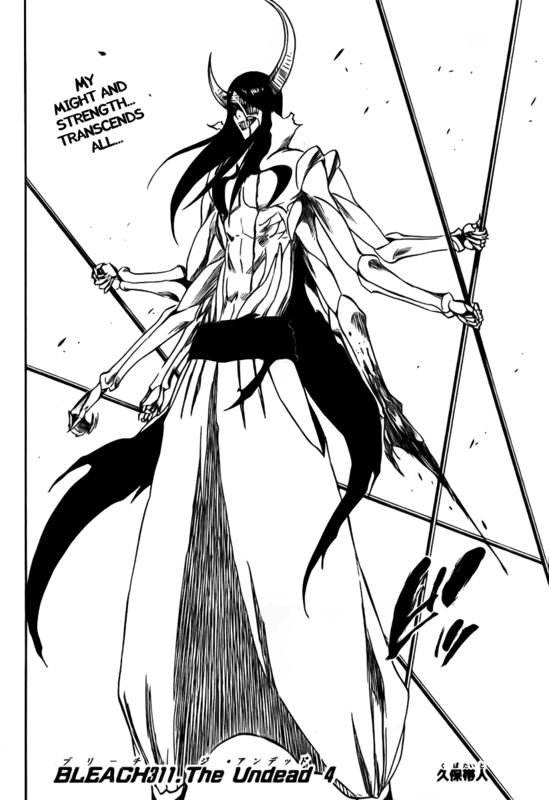 This week’s Bleach spoilers have been posted. It looks like this week is setting the stage for the big battle. The spoilers were fairly small this week but basically it Aizen sets out to destroy Karakuwa Town and all the captains show up at the end to stop them. Well, another late update. But I really can’t be stuffed doing all three shounens right now. Have a lot of work I must get on with. So I’ll let someone else update this, seeing as I haven’t even read it yet. The first few pages look fun though. The spoilers for Bleach have appeared and it looks like quite an interesting chapter. Kenpachi shows his ace up his sleeve although it isn’t as cool as I had hoped it’s pretty fitting of his character. I’ll update as soon as there’s a scan.